Unloading cargo from a container mostly demands a lot of manual labour. For the discharging of heavy equipment DSV in Moerdijk has ‘discovered’ RollerForks. Manual labour demands dedication of people and these days each company experiences the recruitment of logistic personnel as a bottleneck in operational management. For logistic service provider DSV at industrial area in Moerdijk this is the same. For a specific customer discharging was very labour-intensive. Danny de Hoon, floor manager of one of the establishments: “We’re talking about kitchen equipment for professional use, of stainless steel and expensive. These products arrive per container. 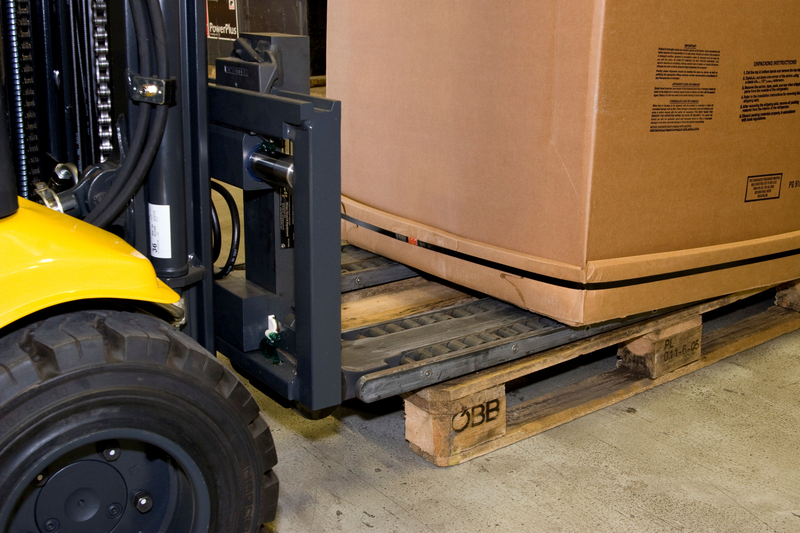 For the storage and transport of the goods a pallet is needed. Till a month ago two people needed to get into the container: a lift-truck driver and a person who would cant the equipment a little so the forks could get underneath it. Outside the container the equipment was then loaded onto a pallet. And again it took some canting and turning to draw back the forks from underneath the equipment. This took a lot of time and increased the risk of damage. Especially the packaging was damaged very quickly and that is not what you want”. A RollerFork is in fact a standard lift truck fork with two layers of rollers; these rollers rotate in the opposite direction of each other. When the lift truck fork is for example pushed underneath kitchen equipment, the undermost rollers touch the floor and cause the uppermost rollers to rotate. In this way the load is easily placed on the forks without a driving mechanism. Because there is no container with cargo from the client at the moment. De Hoon demonstrates the functioning of the RollerForks with the help of a mechanic of Itolang who happens to be there. The RollerForks are easily mounted onto a new OM-X 18. No adjustments to the lift-truck are needed for a RollerFork. De Hoon: ‘It is not necessary to change forks all the time. When we don’t need to unload a container of this specific customer, we can also use the RollerForks for all other material handling activities. That is the advantage with regard to a special clamp fork. Working with this particular fork requires no special skills. ‘You actually need to break a habit. With a normal fork you may not push them across the floor. And that is exactly what you have to do when working with RollerForks. It is easy that the RollerForks are hinged in the heel side. When the driver lowers the fork carrier, all rollers hit the floor automatically. The demonstration is clear. The lift-truck driver can perform the job all by himself. The fork is made in a way that it can simply roll underneath the packaging and when you put the load onto a pallet is not an issue. The rollers keep the pallet at its place and rolls the load on the pallet with the same speed the truck drives backwards. De Hoon has not come across any disadvantages so far. ‘The factory tells us the RollerForks almost don’t need any maintenance. But we don’t have the set that long yet to give an opinion about that. We also can not say whether a RollerFork is worn out faster than a normal fork, but it is likely that a RollerFork is more durable.’ One point of criticism he does have. A set of RollerForks costs more than four thousand euro’s. We recover the costs because of two advantages: the RollerForks reduce damages and demand less labour when unloading containers. 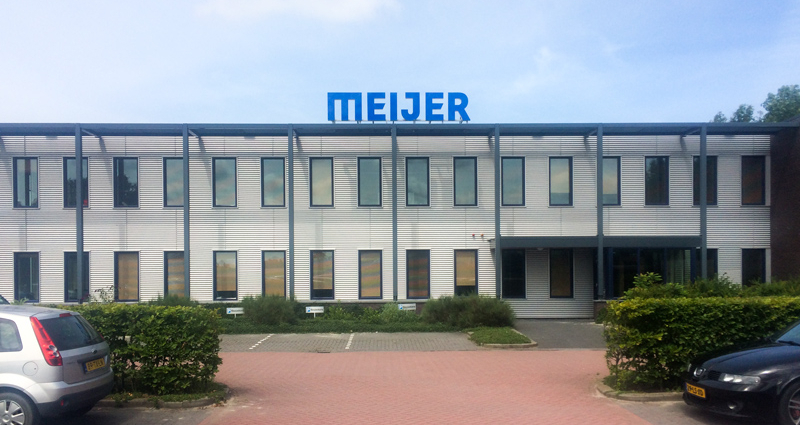 The RollerFork is supplied by Meijer Handling Solutions in Sint Jacobiparochie, producer of lift truck attachments. With the help of the RollerForks companies can load and unload their goods palletless. The load is retracted or – when driving backwards – pushed of the fork automatically. When the lift-truck driver lifts the RollerForks up from the ground the rollers automatically lower and the load is held on the forks. According to the producer the rollers are made from high-grade material that is almost indestructible. The official Dutch “Labour Inspectorate” mentions in the recently published brochure ‘Labour risks during the handling of containers’ that the RollerForks is a tool to improve working conditions. That applies to a number of types of load. The fork is suitable for the loading, unloading and transport of bigger goods like at DSV, and of import shipments that are supplied on slip sheets.